Part 1 with my new intro for this year is HERE. I know that's kind of a crazy picture. I used my CamScanner app and sent it to a student that was in ISS so she could check her work before moving to the next activity. If you don't have CamScanner I highly recommend it! I can scan and save as a high quality pdf right from my classroom - huge time saver! Anyway... next we completed this little booklet. It was all about the relationships between areas and side of the squares formed. Never once did my students plug into a formula while completing their book - I love this! The types of problems are from Christa Lemily here, I just made it into a little booklet for their INB. The students were all commenting about how easy it was and how much sense it made. When we completed our town map next, the students were breezing through. I had to show one example about how mathematicians organize their work because we hadn't been showing work before. But conceptually, they did great! They completed the map with more ease than my students did last year, and these students are classified as "less advanced" than my students were last year. That, to me, says the intro and conceptual booklet worked!! YAY! Next we calculated distance between points. Yes, I know, the distance formula is not explicitly an 8th grade standard. But if I'm doing distance between points on a coordinate grid why wouldn't I mention it?! We talked about how they would see this formula later and it contains the same math as the Pythagorean Theorem. We color coded the same work in both methods so students could see the connections. Hopefully they'll remember this at least a little next year and go look it up. Fingers crossed! So there it is, my week of Pythagorean Theorem and distance. Got any helpful critiques or suggestions? I love all of your materials! I start Pythagorean Theorem next week and I needed something for distance between two points. Thank you for sharing. Thanks Jan!!! I hope it works well for you! I'd love to hear back about how it goes. How did you get the measurements for the Map? Is there a measurement legend that I am not seeing? What a great way to introduce Pythagorean Theorem. I teach hs Geometry and I always assume that students understand where the theorem comes from...and they are usually quite CLUELESS! Thanks! Your ideas are awesome! 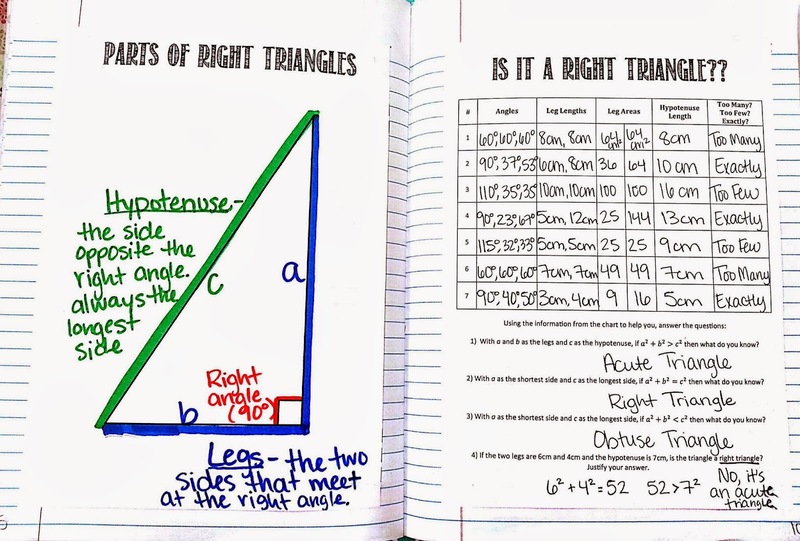 Where did the students get the side/hypotenuse lengths and angles for the "Is it a right triangle?" Chart? I love it! I had the same question about the measurements on the map. I love the idea! Thanks so much for sharing! Mrs. Hester, how did your students get the measurements for the fiber optic problems? I'm in the same boat as the last two. I love the idea but where did you get the measurements for the map fiber optic problems? I would love to use this but need a little more direction. I like how you’re visually illustrating the Pythagorean Theorem. It’s nice how you emphasize the need for a right triangle and then show how things are different when its larger and smaller. I might work that idea into one of my future videos! If you’re looking for other ideas, I recently created a video series where I show how the PT jives with our common sense in 6 different ways. As an example, if the length of one or both legs goes to 0, our formula becomes simpler. Does the PT give us the correct answer for these cases? And why does it? In total, I subject the PT to 6 different common sense tests. It could be fun to talk through one of these ideas with a class? Although focused on the PT, this video series is designed to help students improve their ability to critically examine formulas in general and to increase their comfort level with them. I hope this helps and gives you some helpful ideas!